Discover a more collaborative, real-time way to manage your HR processes. Performance reviews are important not just for ensuring the successful operation of a business or organization, but also for supporting employee motivation and career planning. 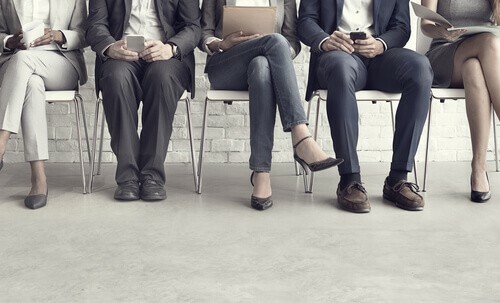 An effective employee review helps to align individual goals with those of the organization, provides clear communication around work responsibilities and objectives, identifies training needs, and encourages positive relationships between employees and management. Performance reviews are also tied to business planning since they often coincide with pay changes and promotions. 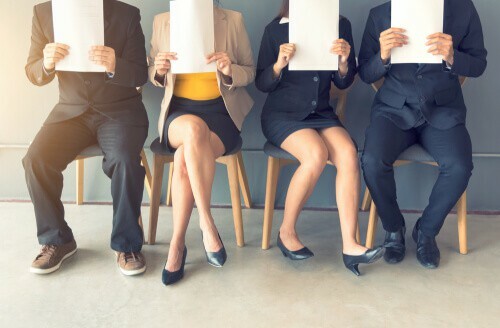 While annual performance reviews are typical, reviews may occur throughout the year for various reasons, from assessing a particular assignment or skill to simply checking in with employees on a more regular basis. Conducting informal, monthly reviews can help to keep management informed, address issues as they arise, and foster positive relationships. Having more frequent reviews takes some of the pressure off of the formal annual review and promotes a culture that values feedback and the review process. To aid your performance management process, we’ve put together a list of free templates for both Excel and Word. The benefit of using a template is that everything you need has already been created, but you can also modify it to suit the needs of your organization. To use these templates, simply download the one that best matches your needs. We've also included templates from Smartsheet, a work execution platform that empowers you to better manage the employee performance review process with real-time collaboration and work automation. 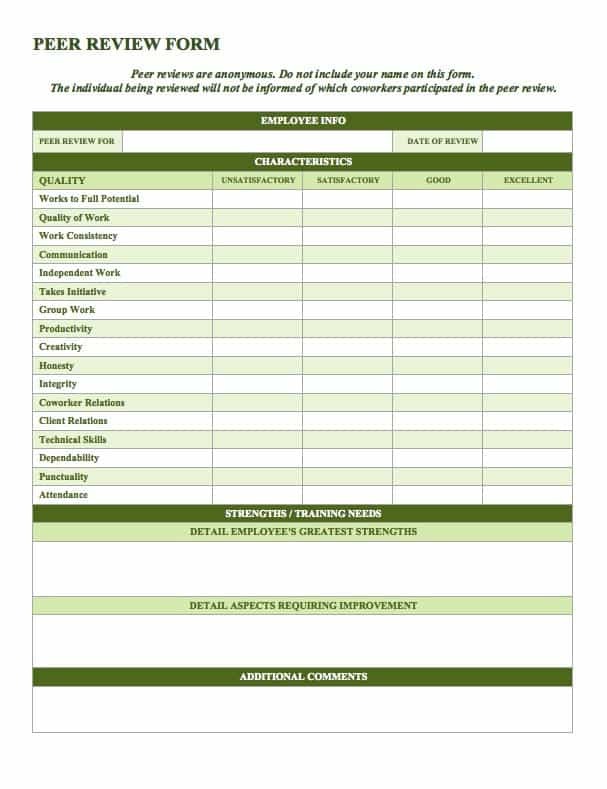 This simple performance review template offers just the basics: a list of employee skills and qualities, and a rating system from poor to excellent. This is not an in-depth, qualitative review, but it provides a snapshot of employee performance and can help guide a conversation between manager and employee. There is a section for comments or additional notes where you can include significant accomplishments or future goals. This is a simple form for situations that do not require detailed written feedback. This employee evaluation form is designed to provide a comprehensive annual review. The template includes sections for measurable objectives that can be weighted and evaluated with follow-up notes. Other sections include assessing employee skills, self-evaluation for employees, and employee evaluation of managers. At the bottom of the template there is also room included for a professional development plan. 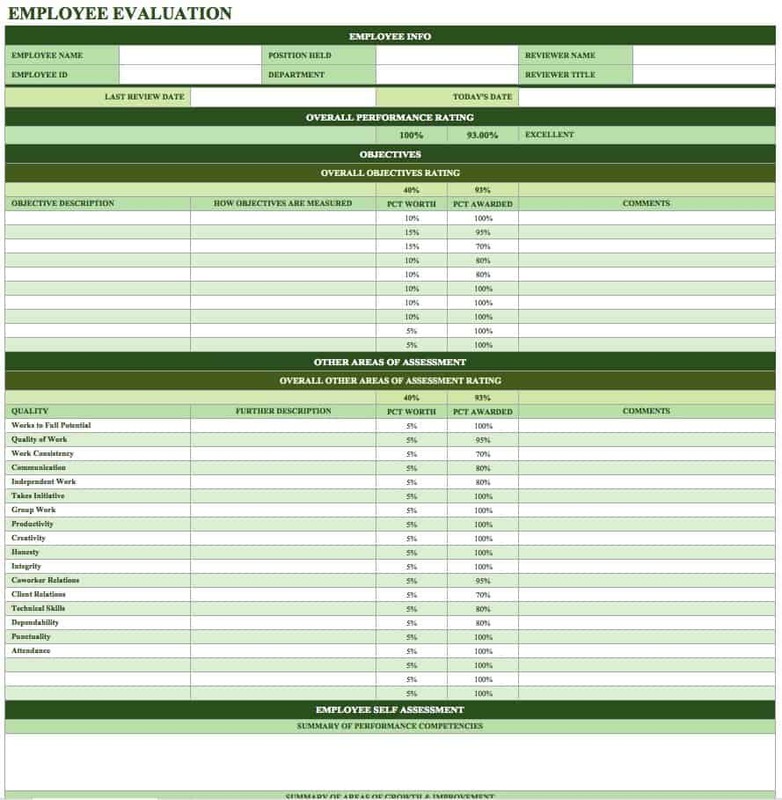 This evaluation form is appropriate for a wide range of businesses, and can be customized to be as detailed or simple as needed. 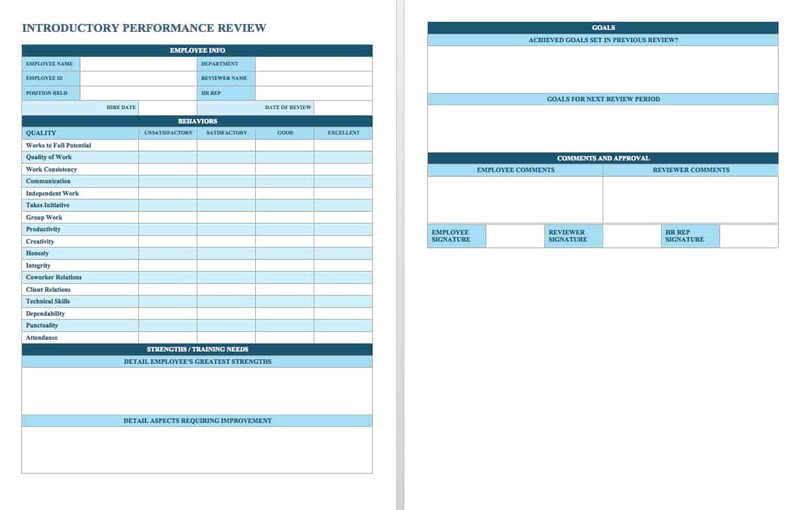 This annual performance review template is separated into four sections: current responsibilities, performance assessment, professional development plan, and employee comments. Use the template to create a detailed narrative of an employee’s performance, including exceptional accomplishments as well as areas that need improvement. Work with the employee to create a professional development plan for the year ahead. This template encourages clear communication between employee and manager, and provides plenty of room for detailed feedback. Document employee attendance with this simple template. Keeping track of employee's past work availability, vacation time, and personal or sick leave can support your performance review process. It’s also just a useful human resources tool for creating a record of employee attendance, including paid sick leave and vacation time. 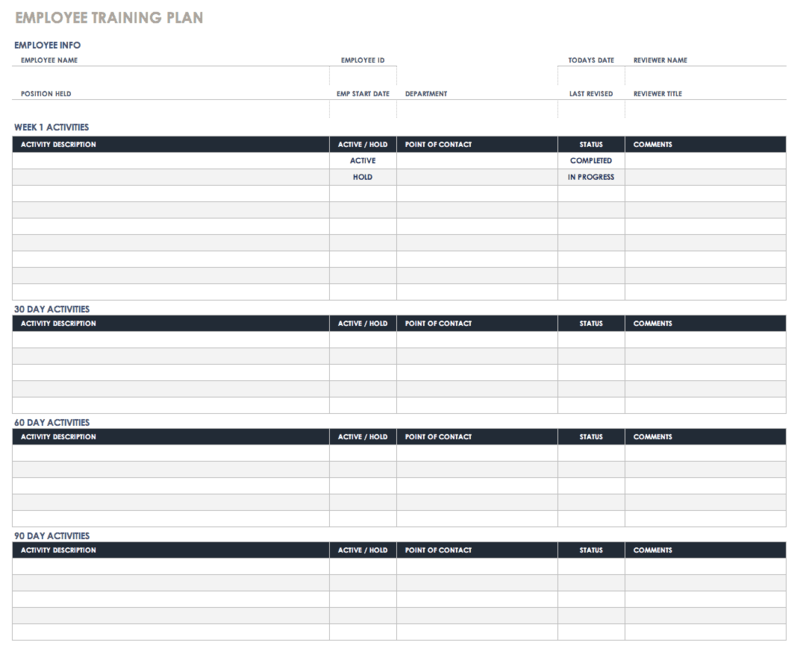 This employee training plan template is designed for new hires to help facilitate the onboarding process. Having a clear training schedule and objectives can help the transition go smoothly, and also provides a document for both the new employee and manager to refer to with questions and updates. After the introductory training period is completed, the template can be used as an evaluation tool to assess progress and create a plan for moving forward. The template includes room for feedback during each stage of training, which will come in handy when the time comes for a performance review. This template can also be used for employees who are moving into new roles. A professional development plan outlines specific goals and a plan of action for reaching them. This template includes sections for listing any training or further education that might be needed, the purpose of each goal toward career development, action steps, support required to achieve the goals, and a timeline. Goals are separated into short-range, mid-range and long-range to address current needs as well as future growth. Taking the time to create a professional development plan can help keep your employees inspired and ensure that your future business goals are reachable. A mid-year performance review supports the annual review by tracking progress and providing a reference point for future evaluations. 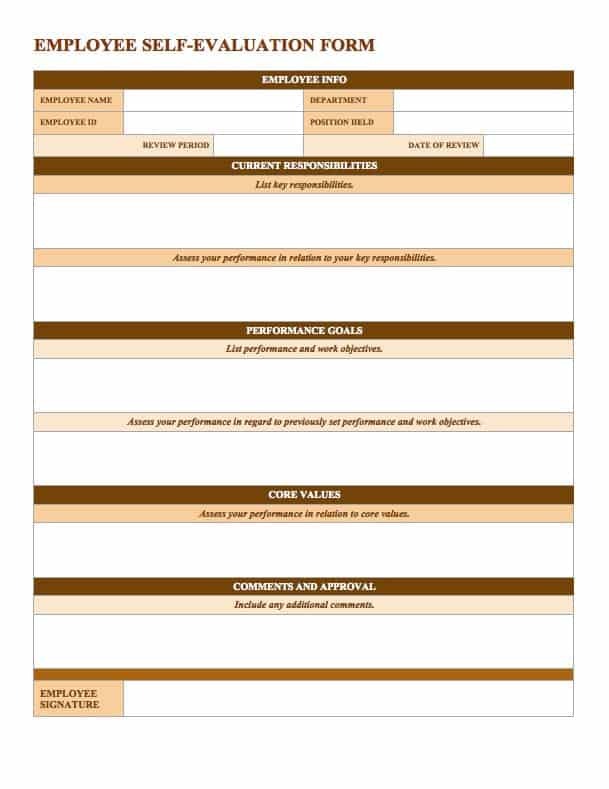 This mid-year employee evaluation form provides a simple layout and rating scale for assessing performance. Sections are included for comments from both the supervisor and employee as well as a goal plan for the evaluation period. 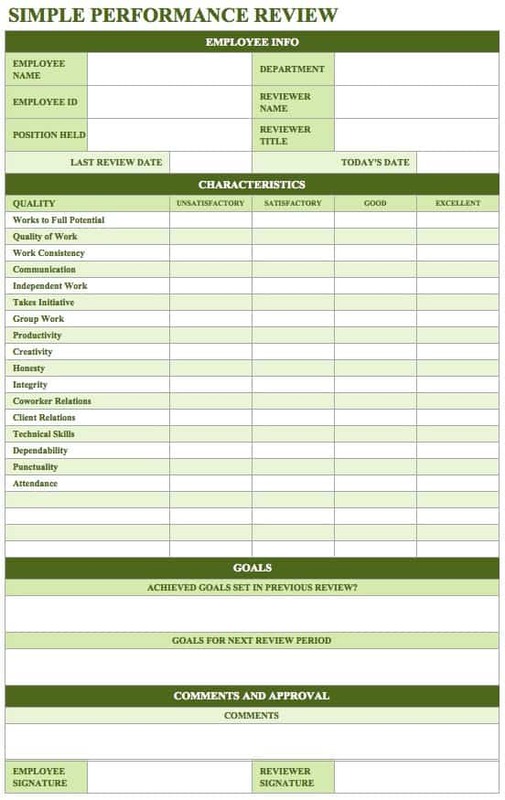 With this template, you can create a detailed evaluation and development plan, or keep it simple for a more informal mid-year review. 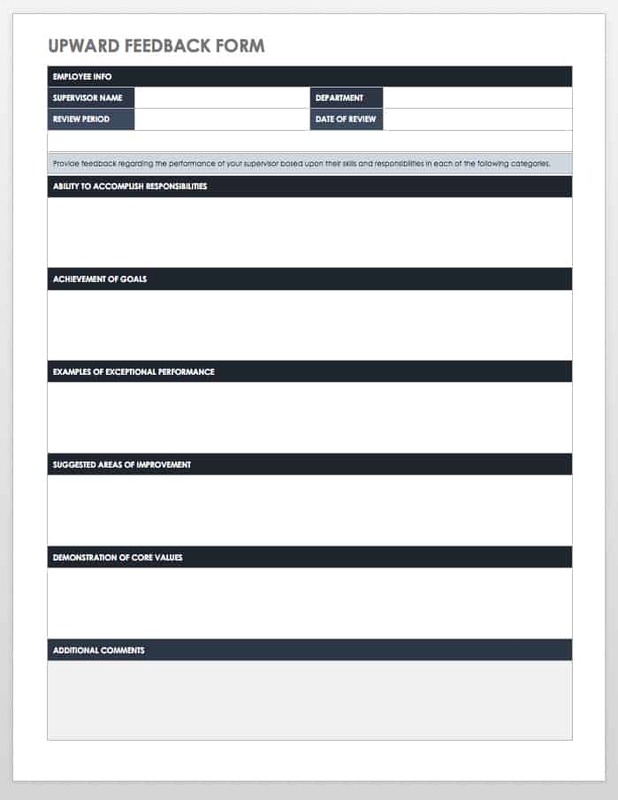 This performance review template offers a simple rating scale for new employees as well as space for providing open-ended feedback, listing goals, and identifying training needs. It’s designed to be used after the typical 90-day introductory period. Conducting a performance review at this time can help ensure that the individual is a good fit and provide a clear plan of action along with adequate support as the employee grows in his or her position. Self-evaluations can be challenging, but they can actually be a meaningful tool rather than just a formality. A self-evaluation is a chance to honestly evaluate your job performance and find out if your manager has the same understanding. It’s an opportunity to own your achievements, let your manager know what you’d like to work on, and focus on your career plan. A self-evaluation can be part of a collaborative effort to define performance objectives and expectations that are in line with both the employee’s career goals and the needs of the business. This self-evaluation form provides an open-ended outline for identifying responsibilities, assessing performance and planning performance objectives. Utilizing upward feedback can boost employee job satisfaction and help develop more effective leadership. 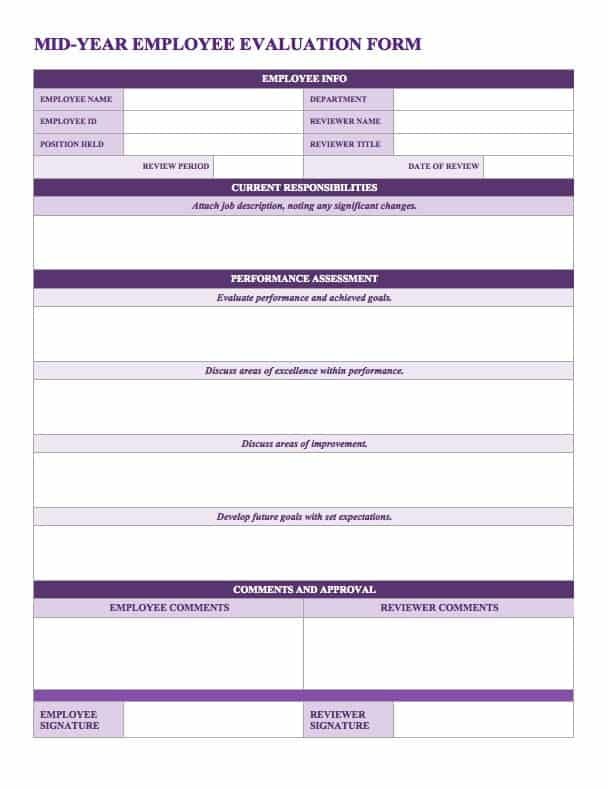 This upward feedback template gives an employee the chance to provide meaningful feedback to a supervisor. The template is uncomplicated and designed to solicit thoughtful feedback on strengths, accomplishments and areas for improvement. This peer review template is intended for organizations that include 360-degree feedback in their evaluations. Competencies are rated using a number scale to provide a simple, quantitative look at performance. You can edit the template to include whatever competencies are relevant and appropriate for a peer review among co-workers. Use this annual evaluation form template to focus on assessing management competencies. List as many competencies as needed to evaluate job performance, then use the rating system and comments section to provide well-rounded feedback. This template also provides a summary of the ratings to give you a quick overview of a manager’s performance. 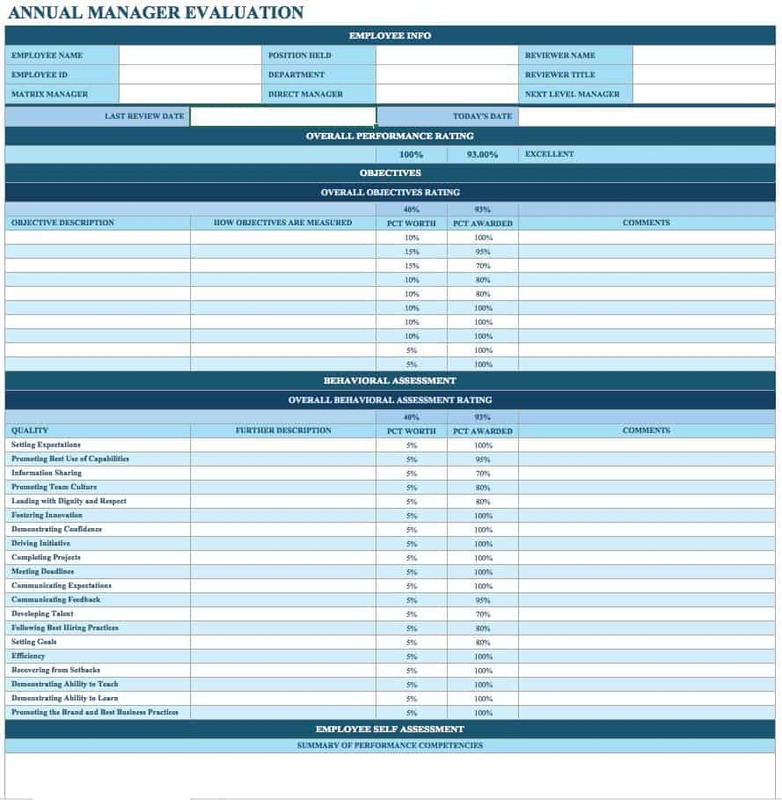 If you need to evaluate a department, team or other organizational group, this template allows you to rate individuals for multiple competencies, and then calculates the total rating for the group. This is a simple evaluation form that can give you a general idea of the strengths and weaknesses of a particular group. The rating assigned to each employee can be pulled from self-evaluation forms or other performance reviews. Evaluating employee performance on a regular basis and maintaining strong transparency is important to keeping your business running smoothly. But that is only one piece of your people operations. To increase efficiency, consider using a tool that empowers you to manage all of your HR processes in a collaborative workspace that you can share with key stakeholders and access in real time. Smartsheet is a work execution platform that enables enterprises and teams to get from idea to impact - fast. Leading HR professionals rely on Smartsheet to help manage everything from simple onboarding tasks to complex change management, recruiting, and benefits and retirement tracking. Use Smartsheet to maximize ROI on recruiting activities, stay on top of budget, and track internal planning and coordination. Streamline process and paperwork, maintain an auditable database without added effort, and grow your business with better informed, more productive employees. Try Smartsheet to discover how you can maximize your human resources efforts, today. 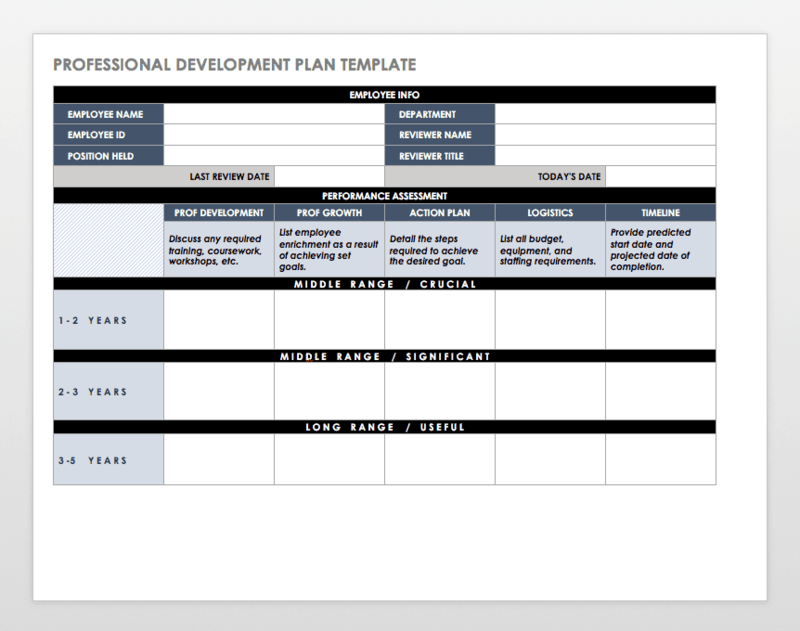 Get started crafting a performance improvement plan (PIP) with these free templates. Learn all about human resources functions, policies, and procedures. Discover an easier way to manage your human resources processes using free templates.